After teasing it Friday evening (there were a couple of items in yesterday’s ticker), the Virginia Tech Hokies released a sports rebranding tweaking yesterday, across all sports. As it has begun doing with other schools, it was all part of a department-wide “branding initiative” by Nike. The school revealed new uniforms for a number of sports, including football, men’s and women’s hoops, baseball, softball, lacrosse, and volleyball. So, in the fall of this year, all 22 athletic programs will begin phasing in new uniforms that will feature consistent logos, colors, lettering and numerals. In 1896, Chicago maroon and burnt orange were decided on by the military student-body as the school’s official colors. They discovered no other college in the country had orange and maroon as its school colors. The official Virginia Tech colors are PMS 208 (Chicago Maroon) and PMS 158 (Burnt Orange). The use of color creates a strong visual impact that reinforces the university brand identity. You’ll note a LOT of corporate speak as the colors, fonts, wordmarks, uniforms and identities are described. As far as “rebrands” go, this one is pretty minor — and that’s not a bad thing. Although the old uniforms weren’t broken, Nike decided they needed fixing anyway. This is much more of a tweak than anything that can rightfully be called a “rebrand.” I like the unis the way they had been up until 2015 — they got rid of the superfluous panels and piping that had affected previous iterations — but kept the shoulder loops. It looks like the pants have lost the the stripes — but we’ll have to see. We also don’t know if VT will have orange elements and a gazillion different helmets as they have in years past. The photos the school released only showed an orange and a maroon version. Nice — and not particularly different from their previous unis — the differences being the wordmark, font & paneling. The new font is consistent across all sports; previously, the football and basketball fonts (as well as for other sports) had been different. For now it appears as the ladies have an orange option (I’m guessing the men will too), and I like how the men have “VIRGINIA TECH” on their maroon uni while the ladies have “HOKIES”. So, while the uniforms are consistent, they aren’t completely exact copies of one another. Not bad, right? The OCD-ist in me likes the fact that all teams will have similar fonts and wordmarks throughout, but I can see how traditionalists might favor the ‘differences’ in styles and fonts across the sports. I’m not convinced such a “streamlining” was needed, but I’m not opposed to it either. 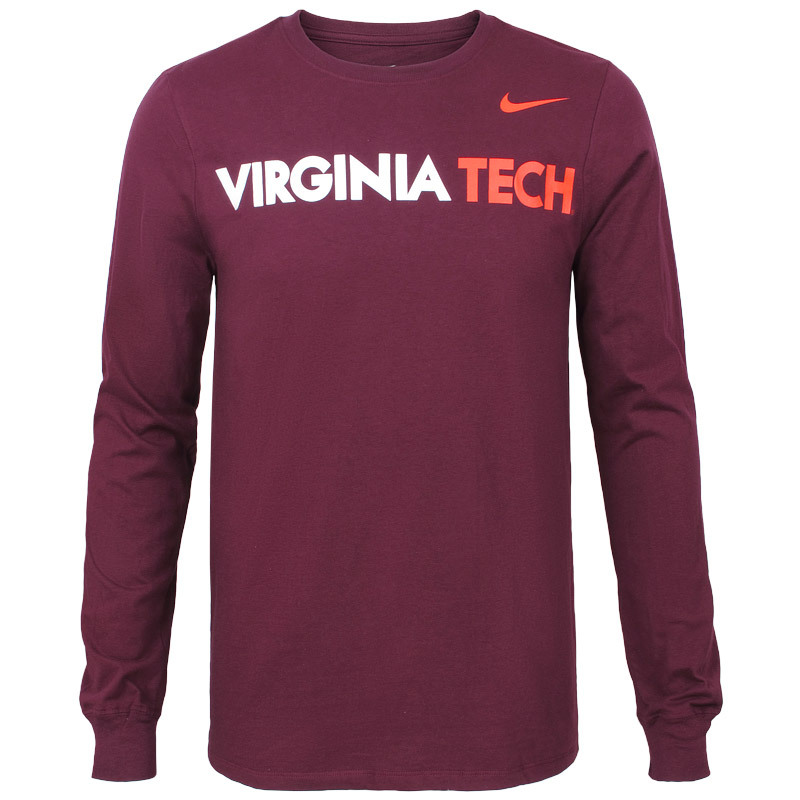 The stylized VT (the abbreviation for Virginia Tech) is used primarily by the athletics department as a symbol for Virginia Tech athletics teams. It signals a strong foundation ”” honoring the tradition that has been built across decades of competition, while creating distinction and reinforcing the brand for the next generation. The wordmark wasn’t consistent before, but here is the one with which you’re probably most familiar. The custom wordmarks are bold graphic treatments that create a clear, consistent, and visually memorable identity. Futurism and Modernism were the departure points for the development of the custom Virginia Tech letterforms. The institutional tagline, “Invent the Future,” expresses the future-altering and future-enhancing work of each facet of the Virginia Tech experience. There’s additional stuff about an alum who worked at NASA and the logo’s font face is roughly based on that. All in all — not much of a change (not really an upgrade or downgrade, which is probably a good thing). You can read much more about “The Brand” and see more uniform photos here. OK, readers — what say you? In case you missed it, Paul’s Friday Flashback on ESPN looked at one of my favorite things in the uni-verse, the “Bumblebee” Pirates (about which both Paul & I have written fairly extensively), and this column gives not only the full run-down of all the possible uni combos, but it ventures into the pillbox caps, Stargell Stars, and Dave Parker’s various facemasks he wore due to facial injury. Baseball News: The Binghamton Mets wore these costumes yesterday. Meanwhile, the St. Lucie Mets wore these. … “Who’s the guy with the California Angels cap in the Mariners dugout?” asks Brandon King. On Friday night, “the Angels were wearing their normal red “A” caps.” … Because Moms and Camo are two great tastes that taste great together, Jason Ricles writes, “Was looking at padres MLB shop page and saw the attached banner. Seems like padres are combining the Sunday navy camo unis with the new mothers day Jerseys this year.” … On May 1st, the Mets are giving away these “Curtis Granderson” socks (coincidentally, I’ll be attending that game with Paul and James Huening). Not to be outdone, the Phillies will be giving away very similar socks (only in Phillies colors) on June 5 (thanks to Paul Ricciardi). … The Durham Bulls will be wearing “Han Solo” jerseys on May 7th. … The Lehigh Valley Iron Pigs wore their BACON USA jerseys yesterday. Mmmmm. Bacon. … Last evening the Lexington Legends (A Royals single-A affiliate) wore these American Pharoah jerseys, which looked a lot like jockey silks (h/t Minor League Promos). … The Twins and the Texases had a battle of the red softball tops yesterday (h/t Barsotta). … Yesterday’s ticker mentioned it, and it happened: Blake Snell became the first Rays pitcher in history to wear a single digit (h/t John Sabol). … “Thought you might be interested in this,” writes Bill Gornall, “the local newspaper has an interview with the artist who created Chief Wahoo. The editor of the paper discusses how the article came about here.” … The Tacoma Schools Night for Rainiers led to these gorgeous argyle jerseys, designed by a student! (h/t Alex Carson). … There was a Colt .45s cap sighting behind home plate in yesterday’s Astros game (from Blair Spangler). … “Sorry for bad picture/lack of more, but a few Princeton players and one Columbia player (as far as I saw) went high-cuffed today,” writes Sam Brochin. College Football News: For those of you into such things, THE Ohio State football finally has a verified Twitter account. You can read more here (via Eleven Warriors). … ESPN apparently now has its own line of Gameday ties (from Tony Arnoldine). Hockey News: Looks like the Panthers training staff wears golf shoes on the ice for better traction (h/t Will Shima). … Fans attending today’s Philadelphia Flyers game will receive these t-shirts — that’s Lou Nolan, the Flyers’ PA announcer, and the t-shirt is apparently a nod to Flyers fans who littered the ice with wristbands during their Game 3 matchup with the Washington Capital (from Thom Pucks). … Do you know where the flag draped over Jim Craig after Team USA won the hockey gold medal in the 1980 Winter Olympics is? The answer may surprise you (from Cassian Wykes). … Looks like the Minnesota Wild have a special Prince Tribute (or something along those lines) planned for today’s game vs. the Stars (from J. Walker). NBA News: The new Sacramento Kings logo has leaked. Chris Creamer’s board has all the details. Here’s a bit more on that (h/t Jake Patterson). … And of course, Conrad Burry has made some guesses as to the possible color scheme(s). … New article from Esquire: “Steph Curry Is Crucial to Under Armour’s Success””And the Brand Knows It.” He’s worth a staggering amount of money to the company (from TommyTheCPA). ”‹… This isn’t breaking news, but the Charlotte Hornets will wear the Nike Jumpman logo on their jerseys when the NBA contract turns over to Nike in 2017 (via Eric Macam). Soccer News: Ireland’s kits for 2016 have now been revealed. … Also, Chelsea’s 2016-17 home kit has been leaked. … Still more leaks: the Schalke 2016-17 home kit. … Pretty cool poster handed out at yesterday’s NYCFC/Philly Union match (h/t Thom Pucks). … A little color vs. color action in yesterday’s Toronto/Montreal MLS match (from Ted Arnold). … Also going color on color, in the women’s game, were the Houston Dash and Orlando Pride (from Robert Hayes). … Here’s a look, in one GIF, at 20 years of MetroStars/Red Bulls jerseys (several sent this in). And that’s it for today. Sorry for the relative “dearth” of usual weekend material, but I spent a large chunk of yesterday at a rehab facility — my mom had major knee surgery a couple weeks ago and she’s expected to be released to her home today. I had lots and lots to go over with they physical therapist, her doctor and others, as she prepares to return home. Today, I get to construct those special monkey-bar toilet seat thingys on two of her commodes, among other things. I gotta say, for someone who is 82, she’s in pretty decent shape and ended up (after some stressful days) being a pretty good patient. But she’s stubborn and often recalcitrant (now I know where I get it), so the next few weeks should be fun. I sometimes wish I didn’t live two towns over (or had some siblings). Happy Early Birthday (it’s Tuesday, the 26th) to Robert P. Marshall, III, our stirrup & college football king. Have a good one, ‘wreck! “Americans are easily spotted in other countries because our clothes have never seen a tailer [sic]. Responsible ones wear a size or two too big for comfort. Young, rebellious kids wear pants falling down to their knees. Thanks for the ticker mention on the .45s cap. Also on that broadcast they showed a little segment where the largest and smallest Astros players switched pants (I was playing with the kids and didn’t catch names). The big guy wears baggy pants and the smaller one high socks. When switched it was quite a sight. The announcers called the (even more) baggy ones pajama bottoms and the (now football looking) ones tighty whities. Then went on to mention that for high socks you don’t roll up long pants but have them tailored that way. I thought everybody had heard of knickers before! That’s actually Texas Tech with the red tops. Texas was wearing its burnt orange tops. No anthracite? No highlighter yellow? WTF was VT thinking? 1. I am guessing that the guy in the Angels cap and mismatched jacket is a clubhouse attendant, since the game was in Anaheim, and he can probably wear whatever hat he chooses. 2. I like the VT “rebrand”, unnecessary though it were. And this doesn’t factor in the 3 retro jerseys, orange jersey, camo jersey, US flag desecration jersey, black jersey and gray jersey that every team will surely wear, though Nike was unusually restrained with previous rebrands. It was nice to see they considered the UCLA stripes an essential element, even in their truncated form. Always wondered why the numbers on the torso go across a change in fabric on Nike’s template – would the performance be impaired that much that they had to start the mesh sweatbox beneath the numbers? It would make more sense to see the number onto one piece of fabric IMO. “Rebranding” – sounds like something the Nazi’s would do after transferring Hokies to a new work camp. I’m fine with the VT rebrand or tweaking but I don’t care for the font used on the baseball jerseys. I find it rather…..wait for it…..hokey. Not a fan of Lehigh Valley wearing BaconUSA uniforms on the road. Similar silliness when Reading was wearing Baseball Town jerseys as visitors. By complete coincidence, I too will be at Shea on May 1! Enjoy your time here, JTH! Phil Knight profile airing now on CBS Sunday Morning. Thumbs up for the Virginia Tech updated uniforms designs and wordmark. I recall reading some discussion of a possible color change on this blog, and I’m glad to see that did not happen. Denver (blue), the Rams (blue), & Philly (green) wore the’team-colored’ cleats in the 70s in addition to Washington and San Diego. Johnny U did not paint his black high-tops powder blue. As a Charger he wore blue adidas high tops with yellow stripes. Few remember that In Super Bowl V Unitas wore low cut Pumas on the Orange Bowl astroturf. The Chiefs wore red adidas with stripes of white, yellow, and white. You’d think Virginia Tech would match their beautiful UCLA stripes with similar stripes on their pants and helmets, like Iowa State. 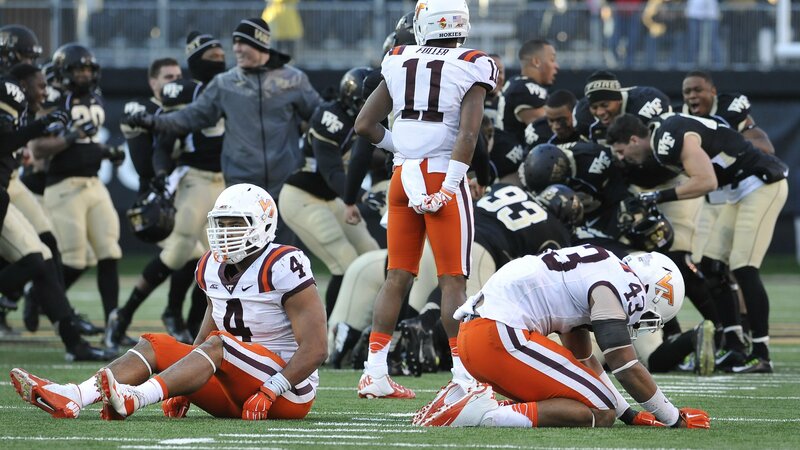 I dislike the new number font, and greatly liked the huge block numbers the Hokies wore the past few years. There is a bit of Star Trek (TOS) to the Virginia Tech typeface, which I guess is kinda fitting for a technical school. As for the colors, VT’s scheme has always been unique, so I’m very glad Nike didn’t mess with it. I wonder if the UChicago Maroons use Chicago Maroon as their base color, or just maroon. In 1974 we were in Warsaw, visiting my then new wife’s family who were showing us round the city. “How do you know?” we were asked. Those appear to be asterisks, not stars. I wish more schools did what Vigina Tech did. So cool to have a clean consistent look throughout all sports. The VT rebranding isn’t horrible, although I agree that the font is awfully Star Trek-ish. But is that the same maroon? It looks like it has more purple in it. I thought the same thing. It looks much more purple than maroon to me. VT Number fond looks a lot like the number font used for the Denver Broncos.